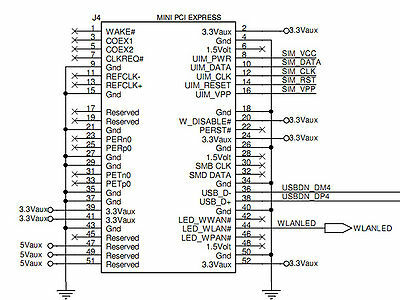 2.1.1 We supply 5V into miniPCIe by using 47, 49, 51 reserved pins. Some cards might overheat or OS might not detected them. 2.1.2 minipcie pin 20 W_DISABLE# is directly connected to 3.3V. This might cause problems with some cards. We supply 5V into miniPCIe by using 47, 49, 51 reserved pins. Some cards might overheat or OS might not detected them. 1) - cut the PCB trace marked with the two red lines as in the picture below. 4) - after these modifications 5Vaux is eliminated from the miniPCIe. minipcie pin 20 W_DISABLE# is directly connected to 3.3V. This might cause problems with some cards. Workaround - Pin 20 from the miniPCIe - W_Disable# is not accessible for cutting. 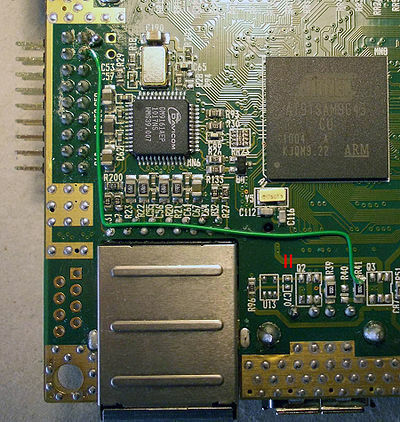 Though, you can raise and remove the connector pin from the PCB using a needle and a soldering iron. 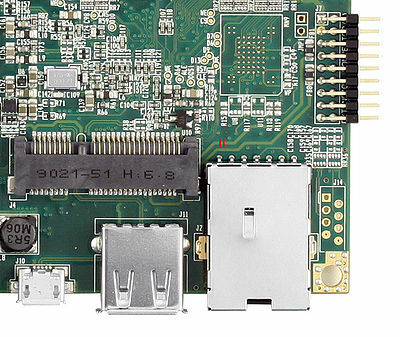 Some USB devices (notably devices based on RealTek 8192CU) have issues when picoSAM9G45 is cold-booted with the USB dongle inserted in the USB slot. Workaround - the C74 value must be increased from 0.1uF to 1uF by replacing the capacitor resulting a longer USB hub reset timer. This page was last modified on 26 November 2012, at 15:56. This page has been accessed 41,305 times.